Qui Nguyen raises to 3,900,000 on the button and Gordon Vayo calls from the big blind. The flop is and Vayo checks. Nguyen bets 5,900,000 and Vayo calls. The turn is the . Vayo checks again and Nguyen checks behind. The river is the and Vayo leads out for 9,400,000. Nguyen folds, Vayo mucks his hand, and takes the pot. Qui Nguyen limps in on the button and Gordon Vayo checks his option from the big blind. The flop is and Vayo checks. Nguyen checks behind and the comes on the turn. Nguyen bets 2,900,000 and Vayo folds. Vayo bets 3,100,000 and Nguyen calls. The turn is the . Nguyen checks again and Vayo checks behind. The river is the . Nguyen bets 4,700,000 and Vayo calls. Nguyen shows , good for a pair of tens, and Vayo mucks his hand. Nguyen bets 7,700,000 and Vayo calls. The turn is the and Vayo checks. 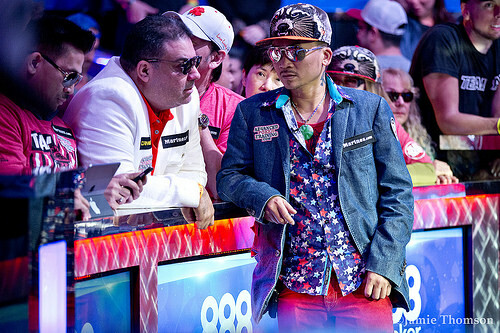 Nguyen bets 9,900,000 and Vayo folds. Qui Nguyen gets a walk. Here is a look at the official chip counts at the start of heads-up play. There is a short break in the action while the table is prepared for heads-up play. 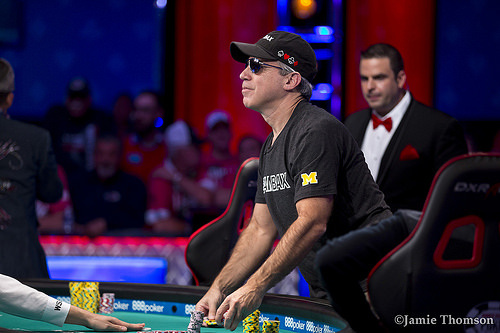 Cliff Josephy moves all in from the small blind for 18,700,000 and Gordon Vayo calls from the big blind. Josephy shows and needs help against Vayo's . 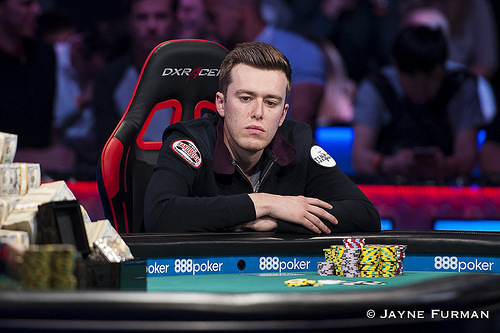 The flop is , giving both players a pair, but Vayo is in the lead with a pair of kings. Josephy needs to hit a queen or a three to stay alive. The turn is the , which keeps Vayo in the lead and doesn't change Josephy's outs. Qui Nguyen's rail is cheering for a king to eliminate Josephy and leave Nguyen heads-up with Vayo. 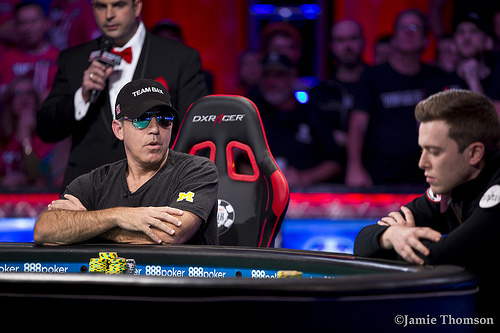 The river is the and Josephy is eliminated in third place, leaving Vayo heads-up with Nguyen. 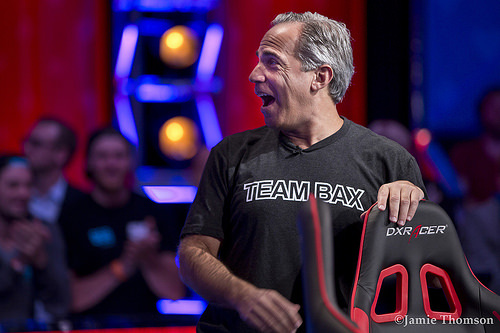 Josephy takes home $3,453,035 for his efforts and he leaves the tournament area with his supporters chanting "Johnny Bax." Vayo drags the pot and takes the chip lead into heads-up play. Qui Nguyen completes the small blind and Cliff Josephy checks his option in the big blind. The flop is and Nguyen bets 1,900,000. Josephy calls and the turn is the . Nguyen bets 3,900,000 and Josephy raises to 9,000,000. 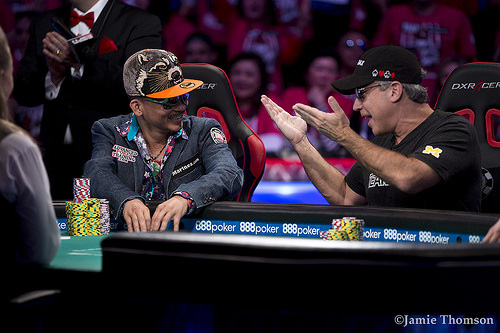 Nguyen calls the additional 5,100,000 and the comes on the river. Nguyen checks and Josephy bets 16,000,000. Nguyen calls. Josephy shows , good for a pair of threes, and Nguyen wins the pot with , good for a pair of aces. Cliff Josephy raises to 3,200,000 on the button and wins the blinds and antes. 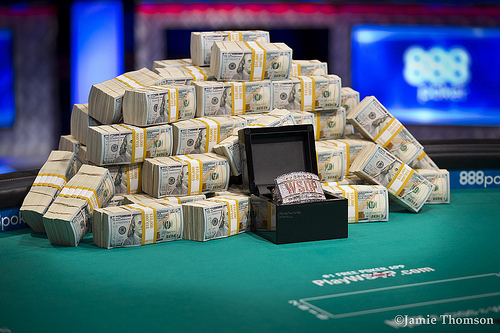 Cliff Josephy raises to 3,200,000 out of the small blind and Gordon Vayo calls the additional 2,000,000 from the big blind. The flop is and Josephy checks. Vayo bets 2,800,000 and Josephy check-raises to 9,900,000. Vayo quickly folds and Josephy wins the pot. 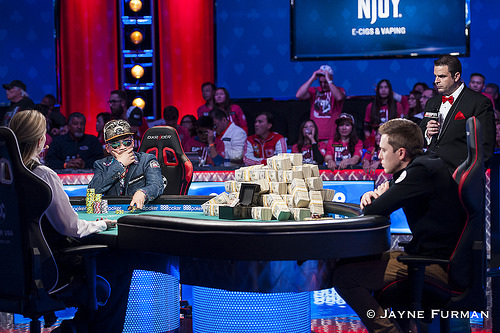 Gordon Vayo raises to 2,600,000 on the button and Qui Nguyen calls from the small blind. 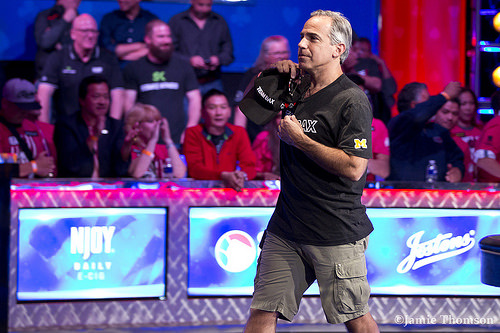 Cliff Josephy folds from the big blind and they are heads-up to a flop of . Nguyen leads out for 2,900,000 and Vayo raises to 7,400,000. Nguyen announces "raise" and makes it 20,400,000. Vayo quickly folds and Nguyen takes the pot. Cliff Josephy raises to 2,500,000 on the button and Qui Nguyen calls from the big blind. The flop is and Nguyen checks. Josephy bets 3,500,000 and Nguyen check-raises to 9,700,000. Josephy folds and Nguyen drags the pot. Qui Nguyen raises to 2,900,000 on the button and Cliff Josephy moves all in for 22,200,000 out of the small blind. Gordon Vayo folds his big blind and Nguyen quickly calls. Josephy shows and is trailing Nguyen's . 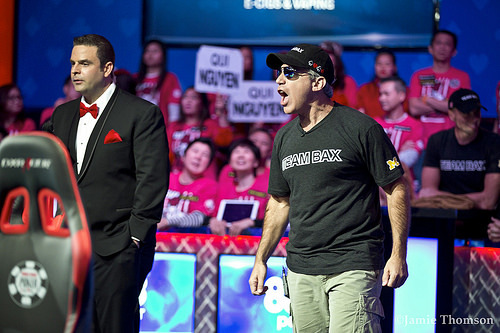 The flop is and Nguyen's rail erupts after Nguyen flops top pair. Josephy flops a gutshot straight draw with a jack and can still hit a king to take the lead. The turn is the , which adds a lot of outs to Josephy's hand. Josephy can hit a jack, a nine, a king, or a spade to double up and stay alive. The river is the and Josephy hits running spades to make a flush and stay alive. 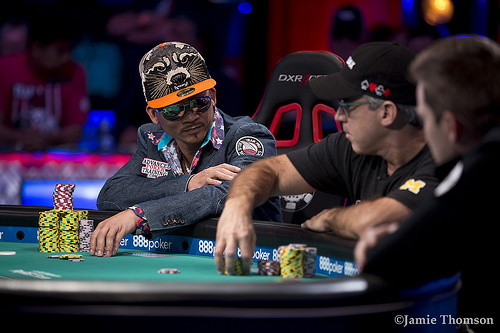 Josephy's rail starts a "Johnny Comeback" chant and Nguyen drops below 100 million chips for the first time since hand #108 of the final table. Gordon Vayo raises to 2,600,000 on the button and Cliff Josephy moves all in out of the big blind for 18,600,000. Vayo folds and Josephy wins the pot. Gordon Vayo completes the small blind and Qui Nguyen checks his option from the big blind. The flop is and Vayo bets 1,500,000. Nguyen folds and Vayo takes the pot. Qui Nguyen raises to 2,900,000 on the button and wins the blinds and antes.